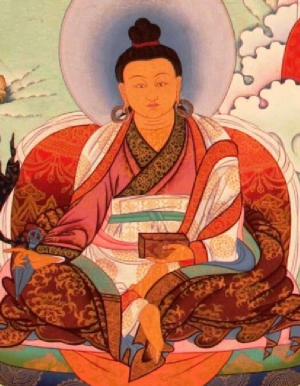 Tertön Sogyal, Lerab Lingpa (Tib. གཏེར་སྟོན་བསོད་རྒྱལ་ལས་རབ་གླིང་པ་, Wyl. gter ston bsod rgyal las rab gling pa) (1856-1926), Sogyal Rinpoche's predecessor, was a prolific tertön and a teacher of the Thirteenth Dalai Lama. From the age of 13 to 18, he stayed in retreat. During this time he saw many things directly through the power of his clairvoyance. 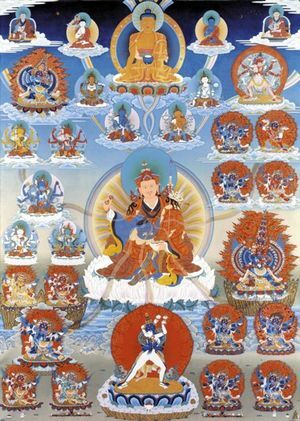 Whilst in retreat, he deciphered a terma in the coded script of Yeshe Tsogyal. After the retreat, he travelled to Kathok with Lama Sonam Thayé and others and received empowerments from Jikmé Yönten Gönpo (aka Tenpé Gyaltsen) and other transmissions from Kathok Getsé Tulku (the reincarnation of Gyurme Tsewang Chokdrup). Later he went to Dzahka Sangak Rabten Ling and received instructions on the preliminaries and main practice of Longsal Nyingpo from Choktrul Rinpoche Kunzang Namgyal. He then went to receive instruction on the Longchen Nyingtik from Patrul Rinpoche’s disciple, Nyoshul Lungtok Tenpé Nyima. Later, he received detailed teachings on the Guhyagarbha Tantra from Mipham Rinpoche for a period of several months. In the Male Earth Mouse year (1888), he met the Thirteenth Dalai Lama for the first time in Lhasa. They went on to meet several more times, and the Dalai Lama became one of his main students and Dharma heirs. In 1895 he revealed the terma of Yang Nying Pudri together with Jamgön Kongtrul. In time, this Vajrakilaya practice became one of the regular practices of the Dalai Lama’s own monastery, Namgyal, and His Holiness composed a manual for practising it as a drupchen. He returned to Lhasa several more times in the following years, and travelled widely, revealing more termas including Tendrel Nyesel, Dispelling Flaws in Interdependence, which became one of the most widely practised among his revelations. His main teachers were Dzatrul Kunzang Namgyal, and Jikmé Yönten Gönpo, the third Trimé Shyingkyong of Katok Monastery. He was also a close student of Nyoshul Lungtok, Jamyang Khyentsé Wangpo, Mipham and Jamgön Kongtrul, and also received teachings from Nyala Pema Dündul and Patrul Rinpoche. His numerous lineage holders, many of whom were also his own teachers, included the Thirteenth Dalai Lama Thupten Gyatso, Jamgön Kongtrul Rinpoche, the Fifth Dzogchen Rinpoche, Dzogchen Khenpo Pema Vajra, Mipham Rinpoche, Nyoshul Lungtok, Dzahka Choktrul Rinpoche, Tertön Trimé, Kathok Situ Chökyi Gyatso, Minyak Khenpo Kunzang Sonam, Dodrupchen Jikmé Tenpé Nyima, Demo Rinpoche, Dorje Drak Rigdzin Nyamnyi Dorje (1886-1932/5), Minling Trichen Rinpoche, Sakya Trichen, the Fifteenth Karmapa Khakhyap Dorje, Jamyang Khyentse Chökyi Lodrö, Tsultrim Zangpo and his main consort, Khandro Pumo. His lineage also continued with his sons, including Rigdzin Namgyal and Chöpel Gyatso, and passed on to his grandson, Tromgé Tulku Dechen Dorje, who lives at the Tromgé encampment in eastern Tibet. He had several incarnations as indicated in the texts of his terma discoveries and in predictions made to his disciples, including Sogyal Rinpoche, who was recognized by Jamyang Khyentse Chökyi Lodrö, and the late Khenpo Jikmé Phuntsok (1933-2004), who received all the transmissions of Tertön Sogyal from Lama Gendun Dargye, a direct disciple of the tertön. Nyoshul Khenpo, A Marvelous Garland of Rare Gems: Biographies of Masters of Awareness in the Dzogchen Lineage (Junction City: Padma Publications, 2005), pages 513-514.